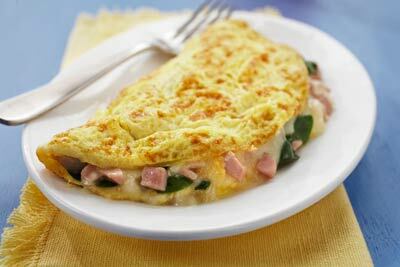 A popular omelet favorite - ham and cheese - gets an added kick of flavor by adding fresh baby spinach. Excellent Source: protein, vitamin A, vitamin D, choline and calcium. Good Source: folate and iron. Beat eggs and water in small bowl until blended. Heat butter in 7 to 10- inch nonstick omelet pan or skillet over medium high heat until hot. Tilt pan to coat bottom. Pour in egg mixture. Mixture should set immediately at edges. Gently push cooked portions from edges toward the center with inverted turner so that uncooked eggs can reach the hot pan surface. Continue cooking, tilting pan and gently moving cooked portions as needed. When top surface of egs is thickened and no visible liquid egg remains, season with salt and pepper. Place cheese on one side of omelet; top with spinach and ham. Fold omelet in half with turner. With a quick flip of the wrist, turn pan and invert or slide omelet onto plate. Serve immediately. Save $1.00 on ONE Febreze Product (excludes Unstopables, Febreze ONE, Car Platinum Ice 1 ct, Car Old Spice 1 ct and trial/travel size).